A rural place beside streams in the folds of hills. Glenside is a suburb located between Wellington and Porirua, centrally located at the southern end of New Zealand's North Island. It is mainly rural zoned and is between the neighbouring communities of Johnsonville and Tawa on the old Porirua Road. Hills, streams and rural landscape characterise the area. The resident population is 345 (NZ Statistics, 2013 Census). The rural sector has eighteen rural landowners with 21 rural titles. Monterey Apartments – there are 91. A small settlement of about 36 houses. Glenside Village is the economic hub of the suburb. The largest employers are the regional head office of Fletcher Construction and OfficeMax. Twigland Gardeners World is complemented by the popular Café Thyme. All these business’ are adjacent to the Glenside Reserve. The largest reserve, of about 12 hectares, was purchased by the Wellington City Council in 1951 with money paid in compensation by Victoria University, then Victoria College, for encroaching on the Wellington Town Belt. It is currently leased to the Glenside Riding Club Inc. and is located behind Twigland Gardener's World. The historic Halfway House is located here. The regenerating bush on the corner of Middleton Road and Westchester Drive began life as a reserve contribution when the Glenside village was sub-divided and developed in c1926. The reserve has been enlarged over subsequent years, and modified with roading encroachment. European settlement dates back to 1840 when the area was called The Halfway, being located halfway between Wellington and Porirua. 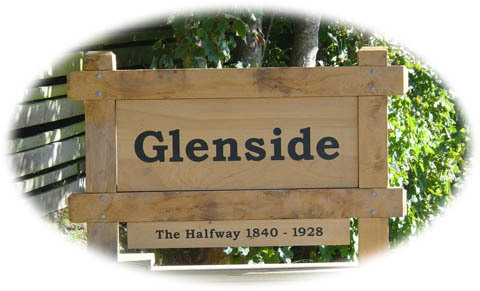 It was renamed Glenside in 1928 when a Post & Telegraph Office was opened in the community. At the time it was thought the postal service would confuse the name The Halfway with Halfway Bush near Dunedin. Ngati Toa are the mana whenua.